Is the US government ready for another bailout? This time it's the US Postal Service, which is quickly headed for bankruptcy. Technology simply passed them by - faster than anyone had expected. For example a large percentage of US teens these days don't even know how to write a "snail mail" letter and where to put the return address, etc. Clearly the USPS has been trying to keep up with the changes by upgrading its offerings (like same day delivery) and its technology. It has also been shrinking its workforce. 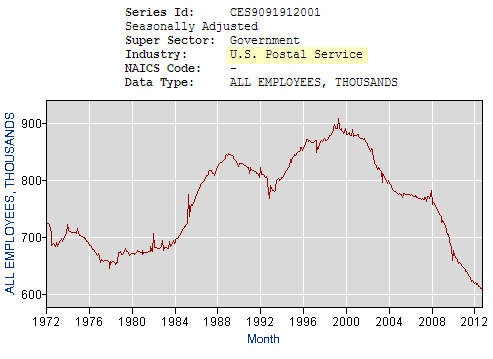 In fact according to the U.S. Bureau of Labor Statistics, we now have fewer postal employees than any time since the late 60s. CBS: - Changes are coming to U.S.P.S. offices and staffing in the coming year. Donahoe said about half of the nation's post offices are "changing." "We're in the process of doing something called The POST Plan. We have 26,000 post offices across the country. We're changing about 13,000 -- half of them to part-time hours. That keeps them open, keeps the town's identity. The zip code, no change there. But we can do a lot more efficiently, there's no reason to have a place open eight hours a day if you have an hour's worth of business." By the end of 2013 the workforce will also have to be reduced. "We have reduced our workforce by 280,000 people over the last 10 years, 35 percent," Donahoe said. "We're in the process right now this year of another 40,000. Our people do a tremendous job. They are very efficient." But losses continue to mount. TwoCircles.net: - The US Postal Service (USPS), which predates the US itself, is careening toward bankruptcy in the wake of a record $15.9 billion loss this year that has ignited fierce debate over the government's role in preserving an iconic American institution. 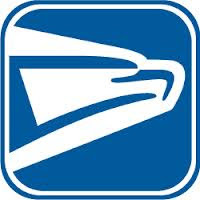 "What we're facing now is our own fiscal cliff," US Postmaster General Patrick Donahoe said in televised comments Wednesday. Donahoe implored Congress to pass legislation by the end of the year that would help it free up capital and bolster its entrepreneurial flexibility. "If they act now, we'll get this whole thing behind us and we can be profitable and then focus on growing the postal business," he said. The travails faced by the agency underscore a deep ideological divide in the United States over the role of government. Conservative-minded critics - including Republican lawmakers - call the agency an unwieldy, inefficient behemoth incapable of competing with private couriers like FedEx and United Parcel Service (UPS). American taxpayers, they say, should not act as a fiscal backstop if it can't survive on the open market. Supporters, meanwhile, say the agency was set up to fail thanks to a 2006 law requiring it to prefund retiree health benefits 75 years into the future-to the tune of $5.5 billion annually for 10 years. No government agencies or private-sector businesses are forced into such onerous terms, they say. 1. The government agency has been completely self sufficient with no taxpayer support - until now. 2. They service 150 million residences, businesses, and PO boxes. 3. USPS has 26,000 retail locations (down from 32,000?). 4. Annual revenue is $67 billion (expenses of course are higher). 5. USPS delivers 40% of world's mail. 6. As a private enterprise it would rank #29 in Fortune 500 (Deutsche Bundespost was privatized in 1995, is it too late for USPS?). 7. USPS.com is the most popular website among the federal government websites (time for advertising?). 8. Apparently it is ranked "the most trusted government agency" - which doesn't say much, but certainly helps. Closing USPS down suddenly will create a massive disruption. Something will need to be done (fiscally or legislatively) to keep the agency afloat - at least until a longer-term solution can be found.